Olive Oil is healthy natural products with high nutritive value. Olive oil is a rich source of Vitamin-E and essential fats. When we speak about nutritionally rich oils present on this planet, it certainly is on the top of the list. The authentic process of preparing its organic form is squashing fresh olives between two stone rollers instead of the standard ‘cold-pressed’ method. Olive oil-derived by this technique is the healthiest among all the other types and is sometimes also known as extra virgin olive oil. Owing to the existence of exceedingly valuable nutrients, it is not only an extraordinary article for cooking but also considered an effective product for skin and hair. 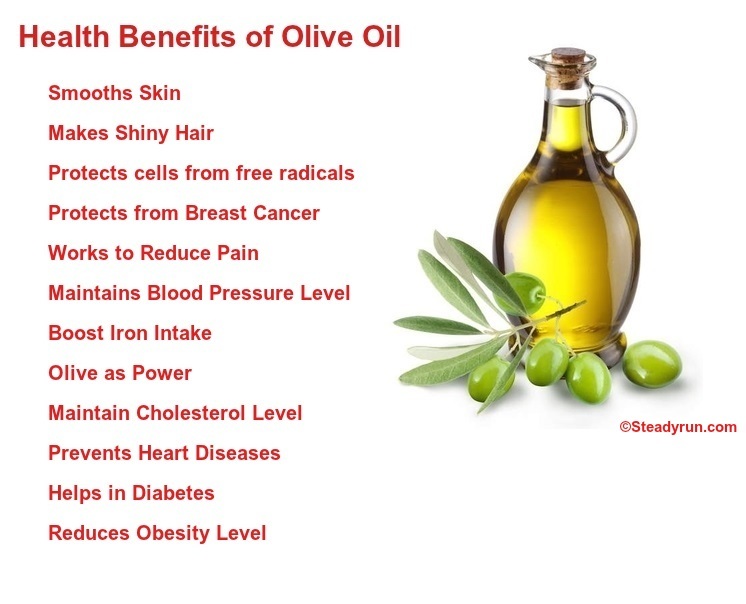 Let’s see amazing health benefits of olive oil here. 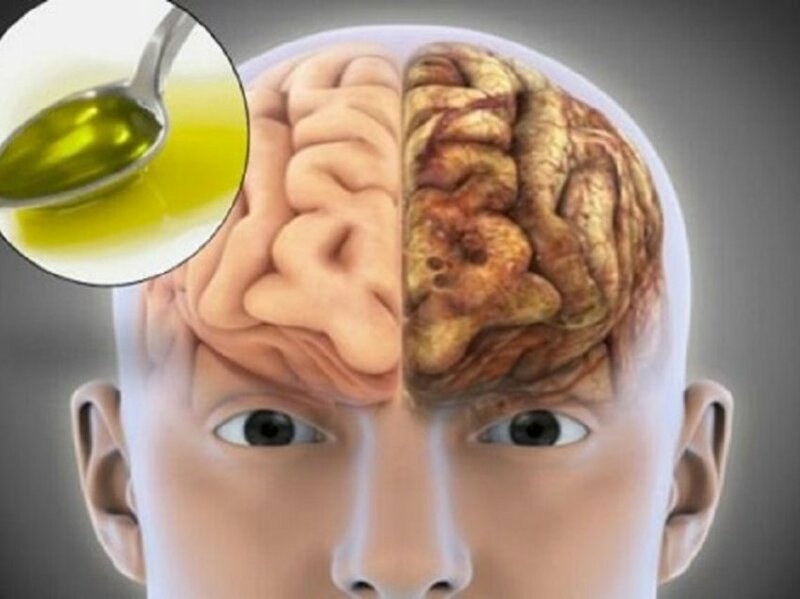 Olive oil nourish your brain and keep you mentally sharp for life. Olive oil is high in brain protective antioxidants. Your brain uses a lot of oxygen — 20% of your total intake. This makes it especially vulnerable to oxidation caused by free radicals. Olive oil is particularly high in natural antioxidants called polyphenols. It contains over 30 phenolic compounds that are potent antioxidants and free radical scavengers. Olive oil is also high in essential brain vitamins E and K. Vitamin E prevents mental decline as we age. Vitamin E, especially in the presence of vitamin C, works to maintain a good memory, slow memory loss, and significantly reduce the risk of Alzheimer’s and dementia. Researchers at Temple University in Philadelphia, Pennsylvania say extra-virgin olive oil “protects memory and learning ability.” Extra-virgin olive oil, also called EVOO, can reduce the formation of poisons in the brain that are signs of Alzheimer’s disease. Here is the reason how ? Researchers say olive oil reduces inflammation in the brain. It also activates a cleaning process. This process is called autophagy. Autophagy is when cells break down waste and poisons found between cells and remove them from the body. 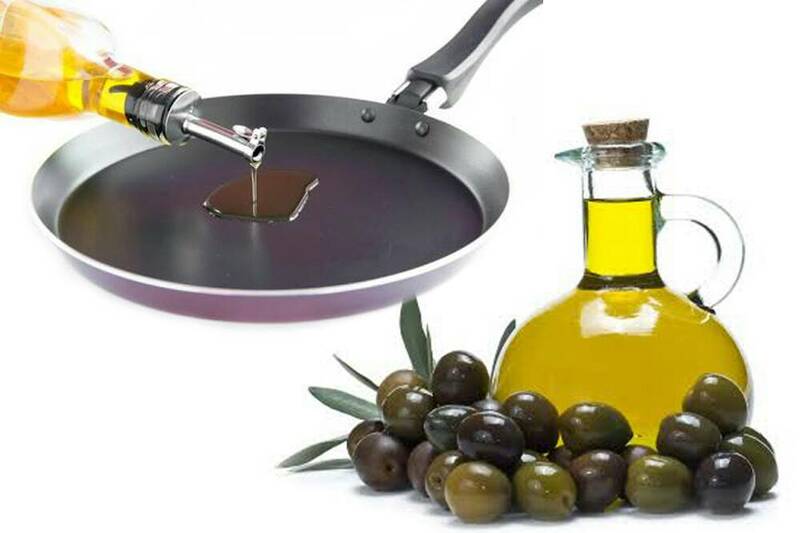 Use Olive Oils In Cooking To Lead A Healthy Life. Olive Oil is simply the oil that’s obtained from the fruit of olive trees. In itself, that sounds pretty simple and straightforward. There are different varieties of olive oil that are set apart not by the type of olive that’s used, but the process used to extract the oil, as well as by the additives, and the oil’s level of free oleic acid. The amount of free oleic acid in olive oil indicates the extent to which fat has broken down into fatty acids. According to the American Heart Association, Olive oil is full of healthy, monounsaturated fats, which help reduce bad cholesterol and lower risk of heart disease and stroke. Olive oil is one of the best and natural oils. This oil is used for various purposes such cooking and cosmetics, etc. It contains the rich amount of nutrients as well as vitamins. It provides several health benefits to the human body, so it’s healthy for people. Individuals who are conscious of their health, are more likely to use this oil for cooking. It is suggested to use this olive oil for cooking because it raises good cholesterol in your body and controls the bad cholesterol. It can reduce the chances of heart disease as well. Apart from these, there are several other benefits that you can get by using this oil on a daily basis. If you want to keep your heart healthy then you must use olive oil. You can use it if you want to make your skin and hair shiny. Plenty of stores are available in the market where you can go to purchase the olive oil. Olives are a remarkable source of antioxidant and anti-inflammatory phytonutrients. Most prominent are two simple phenols (tyrosol and hydroxytyrosol) and several terpenes (especially oleuropein, erythrodiol, uvaol, oleanolic acid). Flavonoids – including apigenin, luteolin, cyanidins, and peonidins) are typically provided valuable amounts by lives, as are hydroxycinnamic acids like caffeic acid, cinnamic acid, ferulic acid, and coumaric acid. The phytonutrient content of olives depend upon olive variety, stage of maturation, and post-harvest treatment. Olives are a very good source of copper and a good source of iron, dietary fibre, and vitamin E.
The health benefits of olive oil are unrivalled, and research reveals more benefits nearly every day. In fact, we are only just beginning to understand the countless ways olive oil can improve our health and our lives. Olive oil is the cornerstone of the Mediterranean diet, an essential nutritional mainstay for the world’s longest- living cultures. Many of the health-promoting effects of the Mediterranean diet have been attributed to olive oil consumption. Replacing butter and other less healthy fats with olive oil has been shown to aid in the prevention of a myriad of diseases and counter effects of ageing. One prominent cardiologist recommends at least two tablespoons of extra virgin olive oil each day to enjoy the many ways olive oil can be beneficial to your health and well-being. Olive oil, especially extra-virgin olive oil, has long been known for its many health benefits and is even said to be the secret to the longer life expectancies of the Mediterranean population. It’s, therefore, no wonder it has numerous health benefits. Let’s see amazing health benefits of olive oil. You can apply the Olive Oil and give a massage for 15-20 min then wash with warm water. It makes your face very shiny. It will help you to get shiny eyelash. Use the olive oil to make your skin very smooth. Just follow the tips to get shiny hair: First warm half a cup of olive oil. Then massage oil into hair and scalp in a circular motion. Then finish up by the massaging tip of hairs. Cover the hair with the shower cap. In the last shampoo the hair after 30 – 45 minutes. This oil is a perfect moisturizer for dry skin. Healthier along with younger skin and get rid of dead cells. Massaging the oil on elbow and knee prevents you from Skin Cancer due to an enormous amount of antioxidants. Normal use of Olive oil will probably make certain the actual cuticles to settle damp along with claws while more gleaming. Virgin Olive Oil will give more strength to fingernails and soft corners. A 100-gram serving of ripe olives has about 1.65 milligrams of vitamin E, a fat-soluble antioxidant that protects cells from the damaging effects of free radicals. Free radicals are molecules that damage cells and might contribute to the development of cancer. Olives contain a compound called oleocanthal that has strong anti-inflammatory properties, mimicking the action of ibuprofen. Olive oil naturally reduces the pain of chronic inflammatory diseases such as arthritis and can be added to a daily diet to aid in pain reduction. Eating olives will help to boost your iron intake Olives contain a substantial amount of iron, a key factor in the formation of haemoglobin, the protein that carries oxygen throughout the body via the bloodstream. Iron also helps to build the enzymes responsible for regulating immune function and cognitive development. A cup of olives contains 4.4 mg of iron. Iron helps in the synthesis of carnitine, an amino acid that converts fat into energy. Besides the iron, it increases the haemoglobin in the blood. Olive oil lowers the levels of total blood cholesterol, LDL- cholesterol and triglycerides. At the same time, it does not alter the levels of HDL-cholesterol (and may even raise them), which plays a protective role and prevents the formation of fatty patches, thus stimulating the elimination of the low- density lipoproteins. It has been demonstrated that a diet that is rich in olive oil, low in saturated fats, moderately rich in carbohydrates and soluble fibre from fruit, vegetables, pulses and grains is the most effective approach for diabetics. It helps lower “bad” low- density lipoproteins while improving blood sugar control and enhances insulin sensitivity. The main type of fat found in olive oil is monounsaturated fat (MUFA). MUFAs have been found to lower your total cholesterol and LDL (the bad) cholesterol levels, and may also help normalise blood clotting. Reducing your LDL cholesterol means your arteries will be less clogged, leading to a lower risk of heart disease and strokes. According to recent research, olive oil could have emotional, as well as physical health benefits. A diet with a higher intake of olive oil and polyunsaturated fats was associated with a lower risk of mental illness. Extra-virgin olive oil has been found to mimic the effect of non-steroidal anti-inflammatory drugs, helping conditions such as rheumatoid arthritis. The compound oleocanthal can inhibit pro-inflammatory enzymes – as well as the risk of Alzheimer’s. When studied in relation to rheumatoid arthritis, researchers found the compound had a significant impact on both chronic inflammation and acute inflammatory processes. Olive oil contains vitamin E, carotenoids and phenolic compounds, all of which are powerful antioxidants. These antioxidants are said to help lower the creation of damaging free radicals in the body. Free radicals are groups of atoms with an odd number of electrons that attach to healthy cells and start a negative chain reaction and can injure blood vessels. Initial studies have shown that an olive oil extract (oleocanthal) may help protect you from the risk of Alzheimer’s disease and cognitive decline, that can often come with aging. excellent article – well done!